Recently I ran across this product in Onyx in my makeup bag. I had gotten this in a set I purchased last year. I've never worn black eyeliner before as I typically stick to brown and plum with my blue eyes. But I went ahead and gave this a try, and although I found the black to be a little dramatic for day wear (and when the hell do I have a night on the town that calls for a dramatic eye? ), this made me recall my love for this product. The next time I placed a Sephora order I ordered this in Stone and I am so glad I did! Basically this is 3 products in one. First, a fabulously soft and smooth eyeliner. On the other end is a smudger, which saves me from using my finger and having to wash my hands. Hidden in the middle is a coordinated eye shadow shade that is perfect for me to use in my crease. I apply Stila Kitten (go enter the giveaway!) 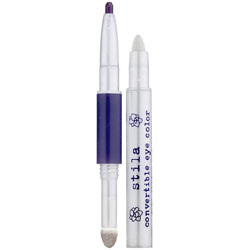 as my base color and then use the stone convertible color in the crease and blend with a brush. Fast and easy, and perfect for work. Don't forget that ebates.com offers 4% back on Sephora orders, and of course, here is the link to see all the official coupon codes for Sephora. Here's just one of their great deals right now. FREE Lip Polish! Get a FREE full-sized Bare Escentuals Buxom lip gloss in Charity ($18 value) when you buy a Bare Escentuals Get Started Kit. Enter code BECHARITY at checkout.